Three lives are bound together by a split-second mistake, and a child’s fate hangs in the balance. What happens next will test—and restore—your faith in humanity. Far from the neon lights of the Vegas strip, three lives are about to collide. A middle aged woman attempting to revive her marriage. A returning soldier waking up in a hospital with no memory of how he got there. A very brave eight-year-old immigrant boy. This is a story about families—the ones we have and the ones we make. It’s a story about America today, where so many cultures and points of view collide and coexist. We Are Called to Rise challenges us to think about our responsibilities to each other and reminds us that no matter how cruel life can be in a given moment, it is ultimately beautiful to live, and live fully. Laura McBride lives in Las Vegas and teaches composition at the College of Southern Nevada. She is the author of the novels We Are Called to Rise and In the Midnight Room. "Stirring...pitch-perfect...a universal story about the messy wonders of community. A-"
"Your heart will break...then soar." 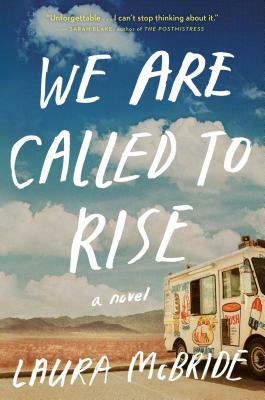 "Rarely does a novel reach into my soul and leave me sobbing, but We Are Called to Rise did just that with its beautifully drawn characters, true-to-life plot, and such exquisite writing that it's hard to believe that this is Laura McBride's first book....a graceful portrait of our time." "The lives of four Las Vegas families collide, reminding us all that every act--no matter how insignificant it might seem--matters. You'll be thinking about these characters long after you finish this haunting, heart-wrenching and hopeful book." "With new books from Stephen King, Hilary Clinton and Lee Child, there will be plenty of competition for beach reading this summer, but the hot season's most intriguing new release might just be the debut novel by 53-year-old Laura McBride." "The consequences of war at home, and the possibility of community in our most atomized places, form the heart of a novel that's by turns hopeful and tragic, but never maudlin." "Hauntingly timely...pitch-perfect...a plainspoken realism that beckons the reader along from page one...reminding us that courage and character are often writ large during the darkest of days." "McBride has written an urgent morality tale for our times in the form of this poignant and gripping debut." "A tour de force of imagination that packs a wallop...immensely moving...without question, McBride is a truly commanding literary presence." "McBride's characters are warm with pulsating vitality....it is a testament to the author's mature voice and storytelling talent that we are willing to take to heart the lessons her story offers." "Here is the powerful story of the way in which war detonates far from battlefields, exploding lives in a single irrevocable moment. Here are unforgettable voices that need to be heard as urgently as this richly imagined story needs to be told. Like a solitary bell We Are Called to Rise reverberated long after I'd put it down. I can't stop thinking about it." “It's been a long time since I invested myself as a reader so thoroughly, so hopefully, in a character as I did for the small, young life at the center of this poignant narrative. Laura McBride writes with the foresight and compassion of the best storytellers. Her range of voices and perspectives is as impressive as her ability to plumb the depths of ordinary lives touched by extraordinary circumstances. This is a tender yet urgent entreaty not to scale impossible heights but to rise to the intimate challenge, and to call forth the love needed, to piece together a child’s shattered home and heart." glitz of that city in their fierce humanity." "Succeeds brilliantly...one of the finest books of the year." "One of the best books I've read this year. It broke my heart and put it back together. It made me cry, and it gave me hope."